Join in and celebrate at Stas and Stella's Mostly Traditional Polish Wedding! This is not just another audience participation ethnic wedding! The musicians play key roles in presenting this Polish tradition but the guests are the real stars as they volunteer to portray the bridal party and family members. 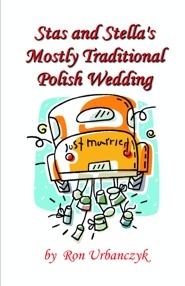 The book focuses on many Polish traditions, Polish customs, Polish foods, and traditional Polish Wedding music and dance! The author touches on the traditions and customs that his grandparents brought to this country and have, in some cases, been forgotten or changed through the generations. The story centers around six musicians who grew up together in a Polish neighborhood. As the evening unfolds, you will experience a traditional Polish Wedding, the way it might have been held 50 years ago and at the same time, learn about the customs and traditions of a small Polish Community in Western New York State. Ron Urbanczyk earned both a Master and Bachelor of Science degree in Industrial Technology from the State University of New York College at Buffalo. He held the title of Corporate Director of Performance Development at a leading Multi-national printing company where he managed several departments, including industrial engineering, productivity support, technical writing, training and development, and commercial technology evaluations. Ron has also led corporate productivity improvement, waste reduction and cost reduction projects. Studying job activities and analyzing work places throughout his entire working career, has led Ron to become proficient at organizing, planning, scheduling and implementing improvement programs. So why is Ron writing a play?